We’ve got the Chicago area kids party entertainment ideas & expert face painting experience you need! 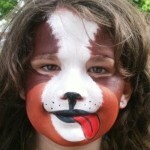 You deserve a face painting entertainment service that gives you one less thing to worry about. Hire us, and you can rest assured that you’ll get Chicago area face painters that have the personality, skills, and experience to keep your guests thoroughly entertained. We’ve provided much appreciated kids party face painting entertainment at Chicago area events ranging is size from a festival in Soldier Field to intimate first birthday party celebrations. You can trust us to impress your guests and make your party more fun and memorable. Tell us about your event and we’ll help you come up with some fantastic kids party ideas and themes.